HP 48G Vs 48S - Which one to pick? This is probably the time teachers ask our children to have a graphing calculator because they start learning more complex problems in their school. There are so many options out there to pick but if you don’t want to spend much, try looking for older units like HP 48G vs 48S. Both of them are indeed not a new items anymore but are still reliable and relevant for purchase, so go check our article below to make sure you are picking the right calculator. Graphing calculator has been used and have a high chance of continue being used in the future because of the benefit and help they provide students when learning in class or home. This tool even recommended by national standards in mathematics combined with the researches that show such technology will help our children by giving a positive effects on their performance. Not only students, teacher is also benefited from using the tool while teaching but for even more various reasons. Graphing calculator is only allowed at a certain level which means teacher only allowed them to use the tool when students already mastered the skill so the learning process can be quicker when dealing with graph or creating a table quickly. The next reason is for connection because the use of graphing calculator let students make connections between different mathematical models and let them to switch between tabular, graphical, and algebraic forms as well. Another reason is it allows the creation of several types of best-fitting regression. With this capability, teachers don’t need to use contrived data that lead to integral or simplistic solutions. The last reason is not very positive but understandable because graphing calculator do lets students leap hurdles when they don’t have enough knowledge or skill in understanding fractions and integers to study algebra properly. With the help of this tool or other similar technologies, all students now have the opportunity to study rich mathematics because the tool will help them to perform the task they are not able to do it themselves. As it has been mentioned above, graphing calculator is indeed helpful and can be an important aid when students learn mathematic in class but as helpful as a calculator can get, graphing calculator is not a regular calculator that we used to count our monthly budget because it is far more complicated and rich features. A graphing calculator is not a tool that everybody can fully utilized without a proper understanding of a concept which is why, new users will need a time to get used to before being fluent. Graphing calculator is also expensive which making it good to search for some information first before purchasing one because they are not a tool that should be replaced in each new class beginning so we have to make sure the price we are paying will last for many years to go or until our children won’t need it anymore. As for classes, they are used in many math and science course such as Pre-Algebra, Algebra 1, Algebra 2, Geometry, Trigonometry, Statistics, Biology and other. When not sure, it is best to consult to the teacher to know for sure about the policy. There are so many options out there when you are looking for a graphing calculator and between those different brands and model, there must be one or two items that catch your attention. HP is a popular name not only in the calculator market but in technology as well because the brand is very well known with their wide variants of products, with good quality and competitive price, making them the choice of so many users in the market since decades ago. Because newer graphing calculators are not cheap, many parents probably want to find the units that offered in a more affordable price and if you are strict about the budget, there are various good items out there offered in an affordable price you will feel light to spend but of course they are not a new models anymore and probably even released or in the market for decades. However, as it has been said before, a graphing calculator is an investment so they will be still relevant even until today. 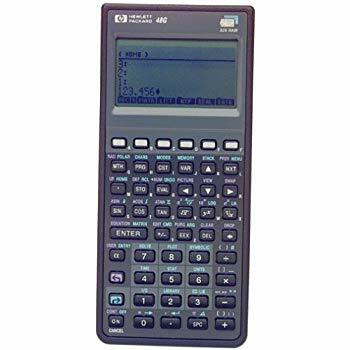 HP have many great graphing calculators and while the new models are just as expensive, the older models are very affordable like the old popular HP 48G and 48S. Just like the name, both of them are coming from the same line which is why they look are similar as well. They are first available starting from 1990 and the time HP stop the line is around 2000 with several graphing calculators in the line covering from the original HP 48SX until the newest 48G+. 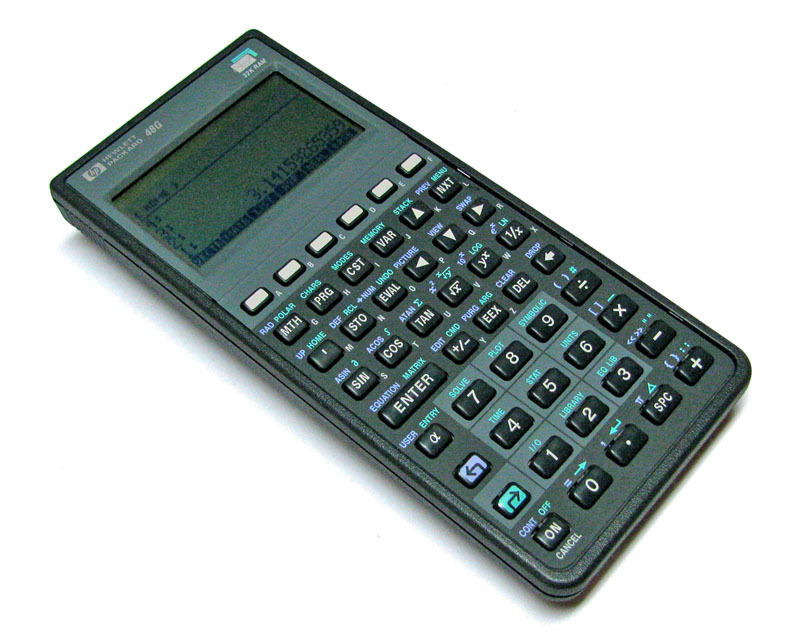 There are another 48 calculators called the 48gII but it is not included in the line because it related more to the HP 49G+. To put it simply, the S model is released earlier or the lower version of the G model because it is indeed improved on some side while the higher end model with an X suffix are coming with expandable memory so users can store more or use the calculator more freely. As for the memory, the highest amount is available in the G+ model. If you are interested on the model that have expandable memory, go check our older article on HP 48G vs 48GX because the two in our article now are not expandable with very similar capabilities and hardware. The 48 line making it look like the calculator is starting with the original 48 but it is not and the lowest model in the line is the HP 48S, so basically comparing both of them in this stage, we already know that the HP 48G should be a more powerful unit. Looking at both of these old graphing calculators, aesthetically speaking, they don’t look interesting in a slightest bit because at that time, tools are made to look serious because they are indeed for serious learning. But, compared to today’s newer releases, they are clearly stating from which era they have come from. There is no difference on the design and all the layout as well as screen still look the same so the only way that set them apart is the name printed above the display. 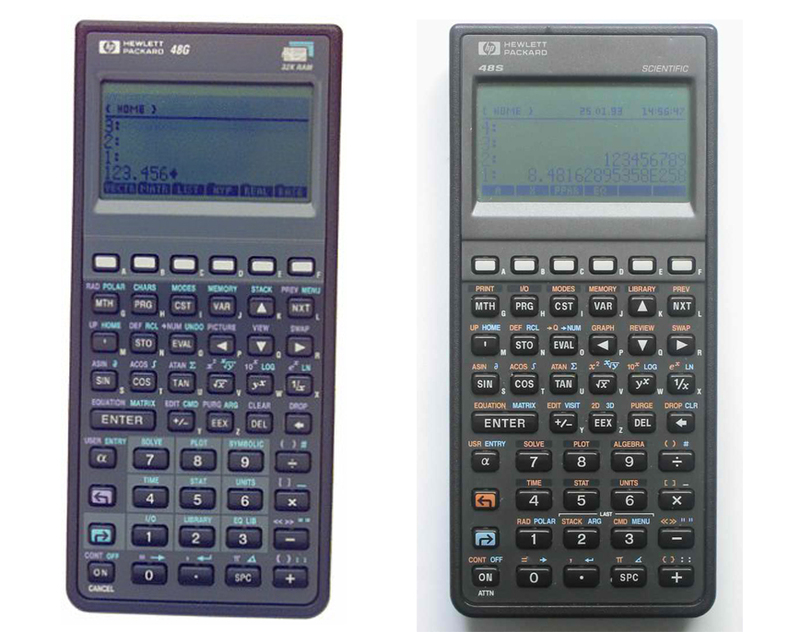 Since the HP 48G only brings upgrade to the hardware model without prominently changing the calculators, what you can have in both units are basically very similar to each other. Let’s talk about the common capabilities such as the display format first. Both of them are coming with several display format that can be used depend on what you are doing currently because they are very useful to help you view the ideal result of the problem. Available formats are Std with 12 digits, Fix that show a fix number of places after the decimal point, Sci that show mantissa between 1 and 10 as well as the exponent and Eng which similar to Sci but the exponents is a multiple of 3. If you are doing simple calculation that includes currency, then the Fix 2 is an ideal option to pick while for Engineering work, the Sci 4 will be very convenient to use. To access these options, use → MODES and pick the format you prefer with CHOOS. The second capability we would like to talk about is the stack use and normally, HP 48G and 48S are displaying 4 levels so when we said level 3, it means the level identified by 3 in the display. When you type any number, they will be placed in the bottom without level while the stack will be pushed up without any change in number but when you are doing an operation, the command line will move to level 1 along with the operation and result that will be displayed there as well. In case you need to swap level 1 and level 2 like when arranging operands for subtraction or division use the ←SWAP key but when you need to remove the item in line 1 and let the stack sink, use the ←DROP while clearing the whole stack can be done with ←CLEAR. Another worth mentioning capability is saving constant which is really useful and to make a new save, you can just type the constant in level 1 then type ‘ and hold the α key to type the identifier. This identifier begins with a letter and when you are done, press STO to show the identifier in VAR menu. When you need to recall this constant to command line, use the corresponding menu keys and because they are named variables, we can use it in algebraic expressions. To change the constant, type a new one in level 1 or in command line and press ← with the soft key for the constant. With this, the old value will replace the new in HP 48G and 48S but we need to press the soft key again to see that the new value has been loaded and to finish it, type the ‘ followed by identifier then press ← PURG to erase the constant and remove it from the menu. The next worth mentioning capability is storing variables in different directory to help the user avoid storing them in a large numbers of directory or to classify them for more convenience. The default directory when we first use the calculator is in HOME but it is not the only option because we can make a new directories to store those variables. To make the new subdirectory within this directory, press →MEMORY and the soft key NEW the move the highlight down until on _DIRECTORY where CHK soft key will appear so press it. The DIRECTORY will be checked and when we move the highlight key up and in the name of the directory, use α key ten press the soft key OK to create a directory. The next capability or HP 48G and 48S is they can treat complex number because they will treat them as a structure that can be stored on one stack level like any item. As opposed of more traditional calculator where they treat x and y as the real and imaginary or magnitude and angle, these calculators are different because they can treat complex numbers like manipulating them like real numbers using the +, -, x and / keys along with square, powers, square root and many more. For example, when you want to do rectangular-polar conversion, it can be done easily by changing the display mode and both of these calculators make working with phasors very simple, convenient yet error-free. To do it, press the → POLAR to toggle the complex number display mode between rectangular and polar but it won’t affect anything whether the polar display mode we are in is spherical or cylindrical because all the complex number on the stack will be displayed in the current mode. The last capability we would like to state here is the defining functions which is also useful when the user often evaluate function repeatedly so it can be more convenient for it will take the arguments from the stack and calculates a value when a soft key is pressed. There are many calculations can be put in this form so defining function will consume less time and error. This function is also work just like the built-in function and doesn’t involve programming. Now, let’s compare HP 48G with 48S. As you can already guess that generally, both of these graphing calculators are capable of doing many similar things and are very beneficial to have. However, because the 48S is older, it is also not as fast as the 48G since in the old machine, HP featured it with 2 MHz Saturn in which the newer machine is coming with 3.68-4 MHz Saturn as the processor. All in all, in our opinion both of them are very similar to each other yet also different. However, if we are to choose, we will recommend you to pick the newer HP 48G because it has better processor for better operation and in price itself, they are equally very affordable.